The editor would like to thank Christian Cognard for corrections. 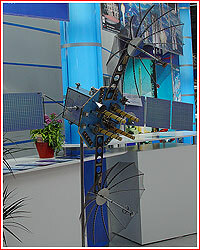 In 2005, with the improvement of economic situation, Russian space agency, Roskosmos, awarded NPO PM (later ISS Reshetnev) based in Zheleznogorsk, a new contract to develop a lighter, cheaper version of relay satellites designated Luch-5A and Luch-5B. 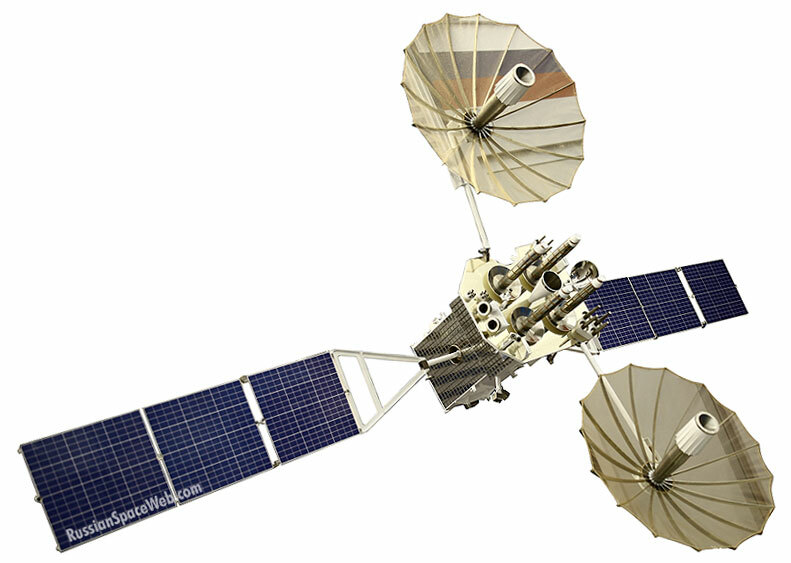 These satellites were designed for a 10-year lifespan instead of three years for Luch-1 and 2. According to the original plan, both satellites would be based on the standard Ekspress-1000 platform and could be carried into the geostationary orbit orbit by the Soyuz-2/Fregat launcher. In June, their scale models appeared at NPO PM's exhibit at the Paris Air and Space Show in Le Bourget, France. With the removal of post-Cold War barriers, ISS Reshetnev outsourced the production of low-noise amplifiers and transmitters for the satellite to Japanese firm Sumitomo. A European Thales Alenia Space was sub-contracted to build power amplifiers and other components for an onboard repeater for Luch-5A and 5B. Positioned in the geostationary orbit 36,000 kilometers away from Earth, Luch-5A was to relay live telemetry and other information from low-orbiting Russian space vehicles as they fly beyond the communication range of ground control stations. The Russian segment of the International Space Station, ISS, as well as unmanned missions, likely including secret military satellites, were reported among vehicles, which could take advantage of the Luch system. In 2009, efforts reportedly started to install communication gear compatible with Luch network onboard prospective remote-sensing satellites. Several sources quoted an altitude of 2,000 kilometers as a ceiling for the spacecraft capable of taking advantage of Luch, however, this info probably originates from a legal definition of "low orbits." More likely, spacecraft could communicate via Luch-2 from much higher altitudes. In addition to spacecraft, launch vehicles and upper stages could reportedly use Luch to relay real-time data to ground stations during active phases of delivering payloads into orbits. In order to maintain communications, antennas onboard Luch were designed to home on fast-moving targets and follow them along their trajectories. The satellite is equipped with a pair of large high-gain antennas, one of which is working in Ku-band and another in S-band. Each antenna can independently track its target. Thanks to the capability of two-way communications via Luch, ground stations could send commands to spacecraft, which otherwise would be beyond their reach. In addition, Luch-5A is capable of receiving emergency signals from the KOSPAS-SARSAT system and transmitting them to ground stations. Lunch had also task of relaying signals from ground stations of the Russian weather service, Rosgidromet. Finally, the satellite was designed to help in correcting measurements from GLONASS navigation satellites, thus improving accuracy of the constellation. 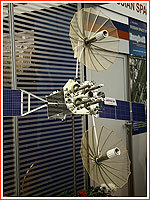 A previous Russian data-relay satellite from the Luch (beam) series flew in 1995 and ceased operations in 1998. Since then, Russia had to turn to services of the US Tracking and Data Relay Satellites, TDRS, for monitoring of crucial operations onboard the ISS, including spacewalks outside the station. Although the high-gain antenna on the service module of the ISS was designed for communications via Luch, additional hardware would have to be installed on the exterior and inside the Russian segment to take advantage of the system by the time Luch-5A flew. According to unofficial sources, such upgrades on ISS were not expected before 2013. The Luch-5A spacecraft and its companion during the ride to orbit -- Amos-5 -- were both based on the Ekspress-1000N platform and designed for a 10-year life span. 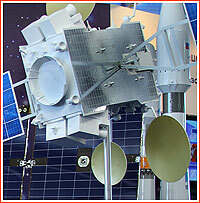 Luch-5A was expected to be stationed at 16 degrees West longitude, where it would deploy two independently targeted S- and Ku-band antennas to enable communications between spacecraft in the low Earth orbit, including ISS, with mission control, as they fly beyond the range of Russian ground control network. Shortly before launch in december 2011, it was decided to deploy Lunch-5A at 95 degrees East longitude. A ground facility for controlling Luch-5A, designated ZS KIS-L No.1 was completed in Zheleznogorsk by the end of June 2011. Originally, the launch of the first Luch-5 satellite was expected in the second quarter of 2009, however it had to be delayed to 2010 and 2011. 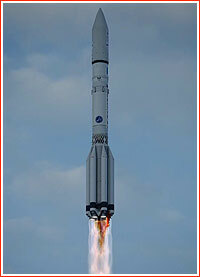 In the wake of the Proton rocket failure in December 2010, the Luch-5A mission, then officially scheduled to fly in June 2011, had to trade places with the launch of the 44th trio of GLONASS satellites, which were previously expected to fly in September 2011. At the time, the Luch mission was expected in September 2011. By the end of May 2011, Roskosmos promised the launch in the first half of Fall 2011. The mission was then likely to slip to 2012, but later moved forward to December 2011. Following the launch of the first Luch satellite, the head of Russian space agency Vladimir Popovkin promised to orbit a second satellite in a series during 2012 and the third - in 2013. A new-generation satellite entered orbit to give back Russian mission controllers the capability of the beyond-horizon contact with critical space missions for the first time in more than a decade. The Luch-5A spacecraft lifted off from Pad 24 at Site 81 of Baikonur Cosmodrome, Kazakhstan, as scheduled at 15:17 Moscow Time, on Sunday Dec. 11, 2011, (6:17 a.m. EST). Several minutes after the launch, GKNPTs Khrunichev, which builds the mission's launch vehicle, confirmed that the payload section had reached its initial parking orbit. Following the third successful firing of Briz-M, the upper stage dropped its external propellant tank some 3.8 hours after the liftoff. The Luch-5A spacecraft, developed by ISS Reshetnev of Zheleznogorsk, shared its ride into orbit onboard the Proton-M/Briz-M rocket with the Amos-5 communications satellite, which was built by the same Russian company for an Israeli satellite operator. The payload section, including the Briz-M upper stage and two of its passengers with a total mass of 3,137 kilograms, first entered a 172.8 by 173-kilometer orbit with an inclination 51 degrees toward the Equator. The upper stage then boosted its payload to a 262.4 by 4,997.7-kilometer orbit and reduced an inclination to 50.4 degrees. Another maneuver moved the pair to a 395.7 by 35,982-kilometer orbit, while further reducing an inclination to 47 degrees. Both satellites were to be released in a circular orbit with an altitude of around 36,000 kilometers, however, Luch-5A would have an inclination 5 degrees toward the Equator, while Amos-5 would be left in a final geostationary orbit with an inclination 0 degrees. Following the release of Amos-5, Briz-M would maneuver itself away from its payload. 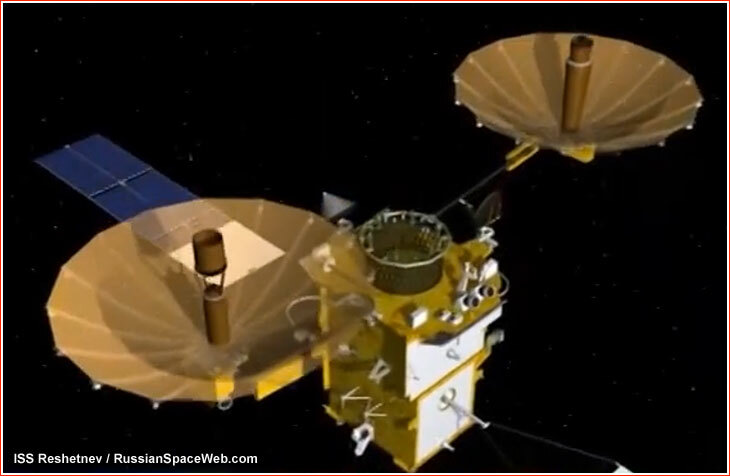 In the early hours of December 12, sources Spacecom, the Amos-5 operator based in Tel-Aviv, Israel, reported that the spacecraft successfully deployed its communications antennas and solar panels and was functioning well. In turn, ISS Reshetnev announced that Luch-5A had been functioning well and both satellites had been performing initial attitude control. 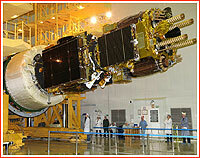 Following a successful launch on Dec. 11, 2011, Luch-5A reached its "working point" ISS Reshetnev announced on Jan. 13, 2012. According to unofficial reports, Luch-5A was first placed at a position 58.5 degrees East longitude for initial orbital tests. The same point was reserved for the KazSat-3 satellite with scheduled arrival in 2014. By that time, Luch-5A would have to be moved to its permanent position at 95 degrees East longitude over the Indian Ocean, instead of the original position of 16 degrees West over the Atlantic. 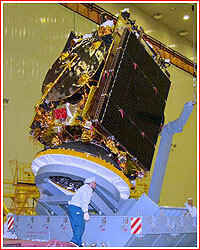 Several weeks after the launch insiders reported that software for a number of instruments onboard Luch-5A had to be re-written and re-uploaded. By mid-December 2011, reports surfaced that one of three star trackers onboard Luch-5A had experienced problems preventing its use in the attitude control system. Even before launch, based on the experience in using similar devices onboard ill-fated Geo-IK-2 satellite, Luch's flight engineers knew that this type of tracker was susceptible to interference and would likely need upgraded software. Although efforts to repair onboard software were conducted during the tests, by the end of March 2012 it was already known that one star tracker onboard Luch-5A apparently completely failed. Moreover, the second sensor experienced a similar kind of problem. As it transpired by mid-April, a circuit which controlled a protective shutter on the first tracker failed leaving it in closed position and thus rendering the device completely useless. (The shutter was apparently designed to protect the sensor from the sunlight only in rare unplanned situations and would not be needed for the nominal use of the satellite.) During fixes to the software on the second tracker, its shutter-controlling circuit failed too, this time fortunately, leaving its shutter in open position, which would enable future use of the device. Engineers late suspected that under some circumstances, midway through the cumbersome software replacement process, sensor's computerized controller could start generating frequent commands for closing and opening of the shutter. In turn, it could lead to overheating of the shutter's magnetic closing mechanism, melting of its wiring and, ultimately, result in the short circuit of the shutter control system. This problem did not manifest itself during ground tests, because software fixes would take much less time on the ground prototype than on the actual spacecraft, whose computers did not have enough memory to take the new software package as a whole and required uploads in segments. By the time of this dual failure, engineers were yet to activate or repair software on the third and last remaining tracker, which was located on the the spacecraft's main antenna. Even without any star trackers, the satellite remained functional and still could be oriented in space with alternative sensors using Sun and Earth. However, several sources familiar with the matter speculated that the loss of orientation by the stars could put serious hurdles in the way of practical use of the satellite. In the meantime, according to official sources, orbital testing of the Luch-5A was expected to continue for a year. (557) During a summer and fall of 2012, mission control commanded Luch-5A to conduct at least five small orbit corrections, which were reported as taken place on July 15, August 7, August 29, Sept. 21 and October 16. Before the end of 2012, Luch-5A was expected to be moved to 167 East longitude. 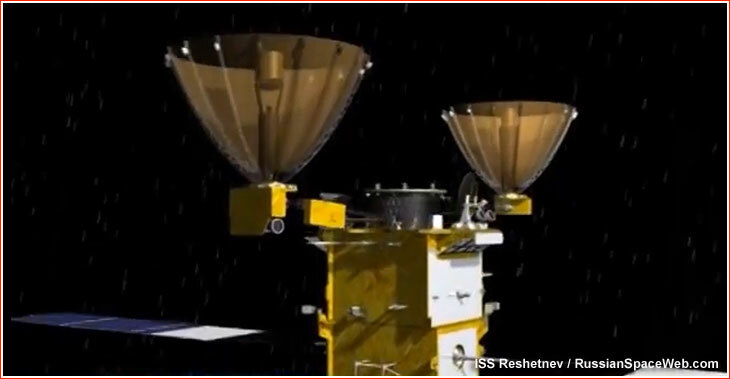 By 2008, following the decision to build a new Russian space port in Vostochny, plans were hatched to add a third, more capable satellite -- Luch-4 -- into the Russian data relay constellation. The latest satellite would have a primary task of "covering" missions from the Far Eastern site, which would head into orbit over the Pacific Ocean, mostly out of view of Russian ground stations. Unlike its one-ton predecessors, Luch-4 would be based on the Ekspress-2000 platform, have a mass of three tons and would need a Proton-M/Briz-M launch vehicle to enter orbit. 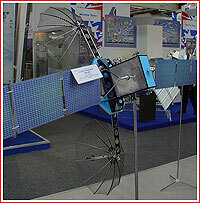 In February 2009, ISS Reshetnev reached a contract with the Russian space agency, Roskosmos, for the development of the Luch-4 satellite designed to function for 12 years. 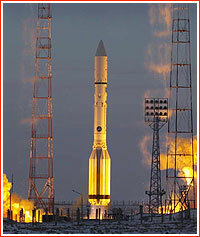 Roskosmos announced the contract for the mission on March 11, 2009 with the launch planned in December 2013. It was expected to enter orbit, while Luch-5A and 5B would still operational in their positions. With Luch-4, developers promised to expand the capabilities of the system to match the US latest Advanced TDRSS network. Luch-4 would have a capability for satellite-to-satellite communications in KA-band and carry an experimental transponder for a mobile personal communications system. By 2012, the development of Luch-4 had been officially suspended until at least 2015. Around the same time, the Luch-4 program was transformed into a Enesei research and development project. Under the new plan, the Enisei-A1 satellite would be launched to carry out experimental technologies, including new large antennas. 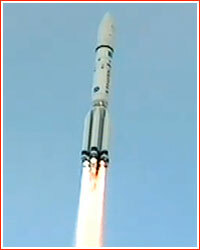 In May 2012, Luch-5B went through thermal and vacuum test and its launch was scheduled for Aug. 30, 2012. By that time, Luch-5B was assigned a position at 16 degrees West longitude, where it was promised to provide communications with the ISS. As of March 2012, the launch was expected in July 2012, however by April, the mission slipped to the middle or end of August 2012. Before the end of May 2012, the launch was set for August 30, however around the same time, an official document indicated that the mission was scheduled for October. A Proton-M/Briz-M rocket carrying Luch-5B as a primary payload and Yamal-300K satellite as a secondary payload lifted off from Baikonur on Nov. 3, 2012, at 01:04 Moscow Summer Time. According to GKNPTs Khrunichev, the payload section including the Briz-M upper stage and two satellites separated from the third stage of the rocket and continued an autonomous flight featuring four firings of the upper stage's main engine. The separation of Yamal-300K took place at 10:18:00 Moscow Time and the separation of Luch-5B took place at 10:33:00 Moscow Time, both as planned, GKNPTs Khrunichev said. After its launch on Nov. 3, 2012, the Luch-5B entered a temporary station position at 58 degrees East longitude over the Equator, however after a series of test it was expected to move to a permanent operational point at 16 degrees West longitude over the Equator. According to ISS Reshetnev, on November 9, 2012, Luch-5B started moving to its operational point at 16 degrees West longitude under control from the TsUP mission control in Korolev. Following the confirmation of its nominal performance, the spacecraft would be transferred to a customer, ISS Reshetnev announced. 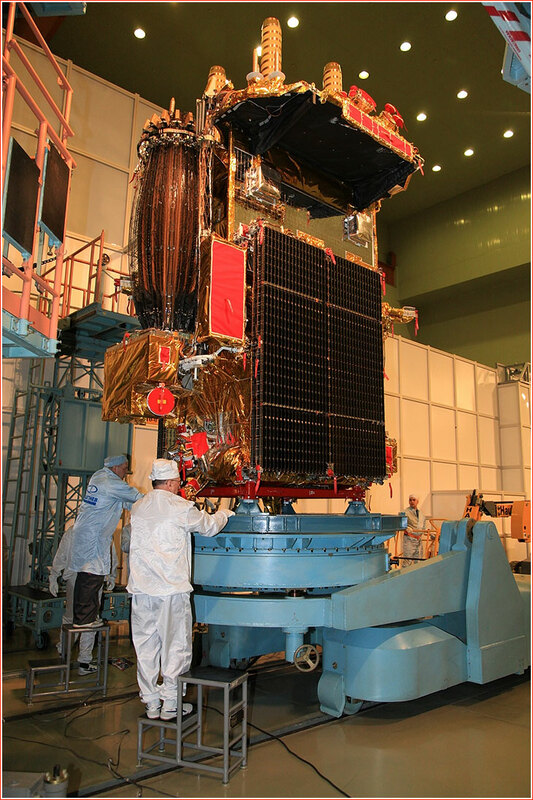 By the time Luch-5A was launched in 2011 and the preliminary design of the Luch-4 was completed, plans had surfaced to replace the Luch-4 spacecraft with the third copy of the Luch-5 satellite. 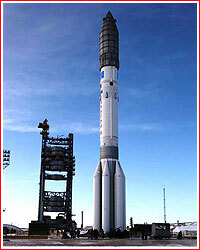 Designated Luch-5V, it would ride to orbit above the KazSat-3 satellite on the same Proton rocket. As of beginning of 2012, Luch-5V was to be manufactured by the end of 2013. As of March 2012, the launch was promised for December 2013 or beginning of 2014, however in May 2012, a Russian document indicated that the mission had slipped to March 2014. Luch-5V was launched on April 28, 2014. Three Luch-5 satellites would comprise the MKSR Luch constellation. (557) In January 2013, a Russian space official said that the testing of the Luch network would continue until 2015, a clear indication for the lack of operational capability of the system.